The principal goal of the segmentation process is to partition an image into regions (also called classes, or subsets) that are homogeneous with respect to one or more characteristics or features [11,16,20, 30,36,66,77, 96,107,109]. Segmentation is an important tool in medical image processing and it has been useful in many applications. The applications include detection of the coronary border in angiograms, multiple sclerosis lesion quantification, surgery simulations, surgical planning, measuring tumor volume and its response to therapy, functional mapping, automated classification of blood cells, studying brain development, detection of microcalcifications on mam-mograms, image registration, atlas-matching, heart image extraction from cardiac cineangiograms, detection of tumors, etc. [8,14,15,35,38,41a, 61,71,88,109,115,132]. In medical imaging, segmentation is important for feature extraction, image measurements, and image display. In some applications it may be useful to classify image pixels into anatomical regions, such as bones, muscles, and blood vessels, while in others into pathological regions, such as cancer, tissue deformities, and multiple sclerosis lesions. In some studies the goal is to divide the entire image into subregions such as the white matter, gray matter, and cerebrospinal fluid spaces of the brain , while in others one specific structure has to be extracted, for example breast tumors from magnetic resonance images . A wide variety of segmentation techniques has been proposed (see surveys in [11,20,30,41,77,83,127]). However, there is no one standard segmentation technique that can produce satisfactory results for all imaging applications. The definition of the goal of segmentation varies according to the goal of the study and the type of the image data. Different assumptions about the nature of the analyzed images lead to the use of different algorithms. • Manual, semiautomatic, and automatic . • Pixel-based (local methods) and region-based (global methods) . • Manual delineation, low-level segmentation (thresholding, region growing, etc), and model-based segmentation (multispectral or feature map techniques, dynamic programming, contour following, etc.) . • Classical (thresholding, edge-based, and region-based techniques), statistical, fuzzy, and neural network techniques . classified into two broad categories: (1) region segmentation techniques that look for the regions satisfying a given homogeneity criterion, and (2) edge-based segmentation techniques that look for edges between regions with different characteristics [16,36,77,96,107]. Thresholding is a common region segmentation method [25,83,98,107,127]. In this technique a threshold is selected and an image is divided into groups of pixels having values less than the threshold and groups of pixels with values greater or equal to the threshold. There are several thresholding methods: global methods based on gray-level histograms, global methods based on local properties, local threshold selection, and dynamic thresholding. Clustering algorithms achieve region segmentation [13,27,37,54] by partitioning the image into sets or clusters of pixels that have strong similarity in the feature space. The basic operation is to examine each pixel and assign it to the cluster that best represents the value of its characteristic vector of features of interest. Region growing is another class of region segmentation algorithms that assign adjacent pixels or regions to the same segment if their image values are close enough, according to some preselected criterion of closeness [77,85]. The strategy of edge-based segmentation algorithms is to find object boundaries and segment regions enclosed by the boundaries [16,36,41,72,96]. These algorithms usually operate on edge magnitude and/or phase images produced by an edge operator suited to the expected characteristics of the image. For example, most gradient operators such as Prewitt, Kirsch, or Roberts operators are based on the existence of an ideal step edge. Other edge-based segmentation techniques are graph searching and contour following [6,14,106]. Traditionally, most image segmentation techniques use one type of images (MR, CT, PET, SPECT, ultrasound, etc.). However, the performance of these techniques can be improved by combining images from several sources (multi-spectral segmentation [29,89,117]) or integrating images over time (dynamic or temporal segmentation [71,93,108]). The following sections will present some of the segmentation techniques that are commonly used in medical imaging. In Section 2 we will discuss several thresholding techniques. Section 3 will describe region growing techniques. The watershed algorithm will be reviewed in Section 4. Section 5 will present edge-based segmentation techniques. A discussion of multispectral segmentation methods will be given in Section 6. FIGURE 1 An example of bimodal histogram with selected threshold T.
FIGURE 2 An example of global thresholding. 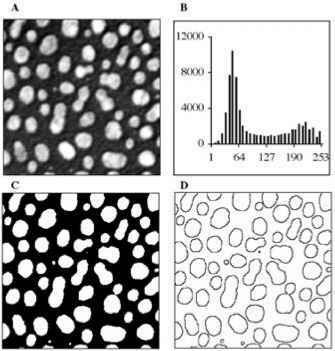 (A) Original image, (B) histogram of image A, (C) result of thresholding with T = 127, (D) outlines of the white cells after applying a 3x3 Laplacian to the image shown in C.
FIGURE 3 An example of the sensitivity of the threshold level selection. 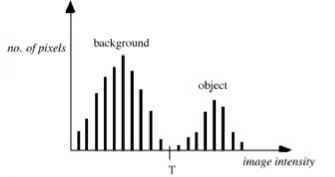 (A) Cross-sectional intensity profile of a light object on a dark background with three thresholding levels T1, T2, and T3, and three other levels generated by adding a small value AT; (B) a hypothetical plot of the area (A) or perimeter (P) versus thresholding level T.
of them is based on a classification model that minimizes the probability of error . For example, if we have an image with a bimodal histogram (e.g., object and background), we can calculate the error as the total number of background pixels misclassified as object and object pixels miscalssified as background. 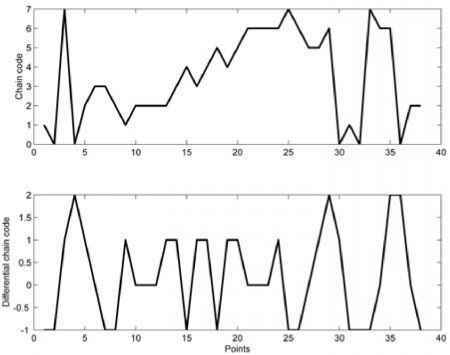 A semiautomated version of this technique was applied by Johnson et al. ) to measure ventricular volumes from 3D magnetic resonance (MR) images. In their method an operator selects two pixels — one inside an object and one in the background. By comparing the distribution of pixel intensities in the circular regions around selected pixels, the threshold is calculated automatically and it corresponds to the least number of misclassified pixels between two distributions. The result of the thresholding operation is displayed as a contour map and superimposed on the original image. If needed, the operator can manually modify any part of the border. The same technique was also applied to extract lymph nodes from CT images and was found to be very sensitive to user positioning of interior and exterior points . Some of the threshold selection techniques are discussed in Refs. [25,96,127]. background, and three threshold levels for segmentation: T1, T2, and T3. A small variation AT in the lowest threshold level will cause a significant change in the area or perimeter of the segmented object. The same is true for the highest threshold level. However, a change of AT in the middle level will have minimal effect on the area or perimeter of the object. The object area A(T) and perimeter P(T) are functions of the threshold T that often exhibit the trend shown in Fig. 3B. Therefore, the threshold level that minimizes either dA(T)/dT or dP(T)/dT is often a good choice, especially in the absence of operator guidance and when prior information on object locations is not available.